Catalogue No. 's R 6118 - 7"
12 R 6118 - 12"
Release Dates 18th November 1985 - 7" and 12"
9th December 1985 - 7" "cut-to-shape" picture disc. Detail : Paul's thirty-sixth single. 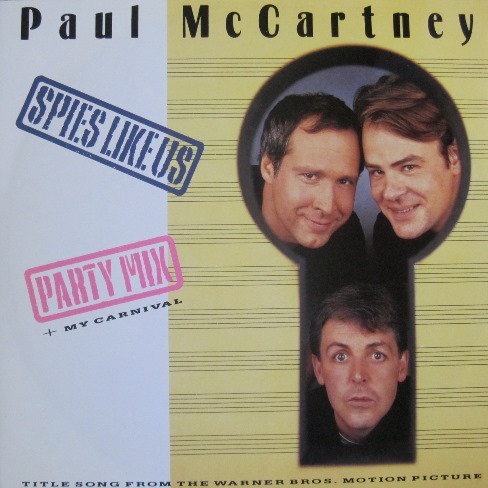 Credited to "Paul McCartney", although My Carnival is credited to "Paul McCartney and Wings". 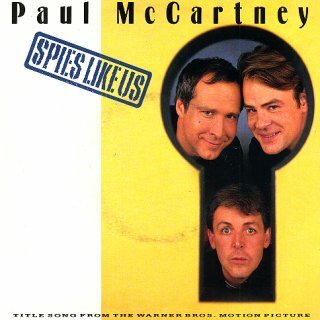 In September 1985 Paul recorded the song "Spies Like Us" for inclusion as the title song in the Chevy Chase and Dan Ackroyd movie of the same name. Prior to the release as a single, on 9th October, Paul is joined by the stars of the film in Abbey Road studios to record a promo video, which is directed by John Landis. A dreary venture, which is as though Hope and Crosby had set out on the road to Morocco without a script. ! This release included "My Carnival" as it's B-side, which was originally recorded in February 1975 for "Venus and Mars" but saved for 10 years for this release, hence the credit to "Wings". The 12" includes a "Party Mix" over 7 minutes long and mixed by John Potoker. An "Alternative mix - known to his friends as Tom" which is just under 4 minutes and remixed by Art Of Noise ... and ... A "DJ Version" at 3:46. There is also a "Party Mix" of My Carnival which runs to 6 minutes, is mixed by Gary Langan and carries a dedication to "Professor Longhair". The single was released in a picture sleeve, with front cover photography by Linda, and the rear by David Morse. The 12" includes a larger montage of pictures on the rear as shown above, and the 7" has a selected portion from that. Further picture disc 12" and 7" versions followed, containing the same mixes. 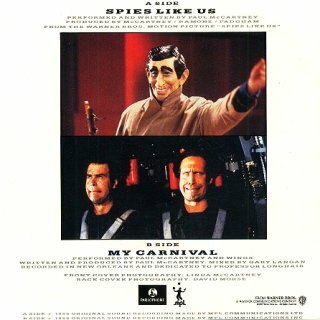 None of these releases are particularly rare (or valuable), but there is a promo version too, with a catalogue number of RDJ 6118 which contains the "D.J.Version" of Spies, backed-with My Carnival. This is valued by "Record Collector" at £20.